Preheat oven to 400ºF. In a large bowl, combine the biscuit mix with the fish base. Add the cream and mix well to combine. Using a rubber spatula, fold in the shrimp and scallions. Spray a sheet pan with nonstick spray. Divide the dough into 8 equal portions and place on the sheet pan, flattening slightly. Place the sheet pan directly into the oven. Bake the biscuits 18 minutes or until golden brown. Carefully remove the biscuits from the oven and let cool for 2-3 minutes. Add half and half, hot sauce, lemon juice, Fish Base, and lemon zest to the prepared gravy and stir to combine. Remove the gravy from the heat and whisk in the butter. Gravy can be thinned to desired consistency by whisking in small amounts of milk. Divide gravy equally among 4 plates. 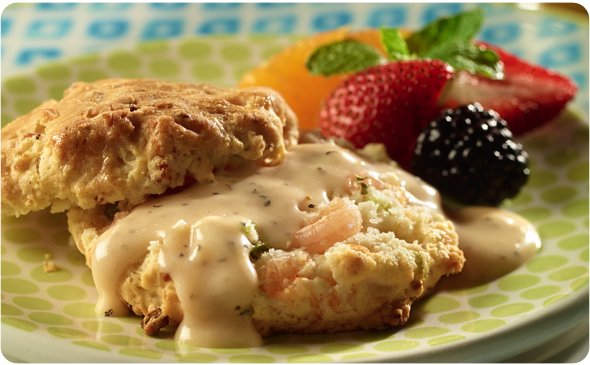 Place 2 shrimp biscuits on each plate, sprinkle with parsley, and serve immediately.